Todd Markway's fate was laid out for him that chilly February 29 when he was born. The Hat Man was coming for him; it was just a matter of time. And no one can stop the Hat Man - no one, that is, but a bunny. Todd's spirit guardian has kept him alive, defending him from the most fearsome "shadow being" in the spectral world on Markway's fourth and eighth birthdays. But the rabbit, Galbey, is gone, and the most critical birthday of all is coming up - Todd's 12th. And this time, he's on his own. Mom is too wrapped up in herself to bother with Todd's "silly delusions of persecution". Her boyfriend, Hawk, just drinks, grumbles, and stares at the TV. Todd is on his own against a dread spectral menace bent on his destruction. Here comes Ether Cottontail, hoppin' down . . . . This was a fun little short story about a young man who is stalked by a nasty paranormal entity known as the Hat Man due to a a matter of the timing of his birth. I will say that the tale does not follow your expectations. 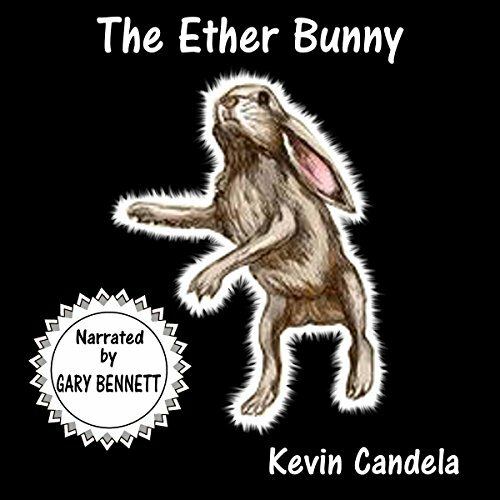 The ether bunny is the being that had protected the child from the Hat Man for the whole of his life; the only problem is that that wascally wabbit has passed on to the next world. Yep, he died. Now, the poor kid is on his own, and he has no idea of how stop the Hat Man. So, he's pretty much doomed. And if he fails to stop the Hat Man then his fate will be waaaay worse than just dying. The story hops right along, and it holds your interest. You genuinely feel for the poor kid, and empathesize with his plight. The Hat Man is menacing, and the possible fate of the young 29'er is nasty enough that you don't want to see him fail against the Hat Attacker. Candela is a fun writer, and you will enjoy the story. The only issue I had was with the audio itself, not the narration by Bennett, he does a fine job in bringing the story to life. There was some sort of sound distortion early on, which reminded me of those old play a record and turn the page as the story moved along books. There was some scratches and small pops at he beginning, but nothing distracting or unbearable. Just enough to notice, and then it was gone, so don't let that deter you. Even though I did receive a promo code for this review it in no way influenced my considerations of the material, and in fact, inspired me to be more honest. In fact, getting a code generally makes me harsher as a reviewer as I am more often concerned what someone like Me will decide based on my review. Wow! I never expected how unique and interesting this book is. I really like it. I’m just glad I barely missed being a leap year baby. Poor Todd!